JustLOVE offers opportunities to speak to the (sometimes wearied) spirit of those who help change the world. Activism, seeking justice, promoting peace and wellbeing, all come at a cost and require great bravery. 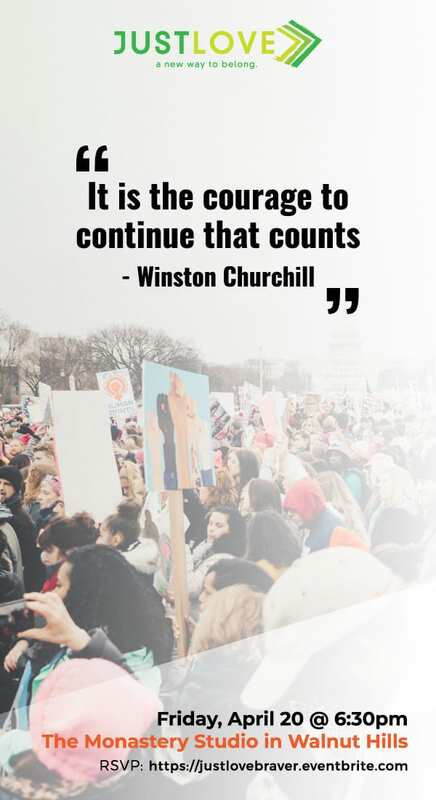 We believe that in order to persevere with the important work of justice, to be a successful change agent, and courageous of heart, we need reminders that we are not alone in our efforts. These events each concentrate on a different theme, led by clergy of multiple faiths and local activists, with the purpose of joy, support, and a restoration of positive energy. So that each of us might return to our work strengthened by our time together. Join JustLOVE for an evening of liveliness and celebration of courage through live music, inspiring conversation and meaningful connections. This month’s theme is: Courage.